On sale! 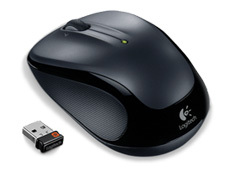 (normally $35) The Logitech M325 is a wireless mouse that delivers a better mix of precision and comfort with designed-for-Web scrolling and a feel-good, contoured design. The convenience of a wireless mouse comes together with a huge battery life of up to 18 months, so you don't need to worry about changing batteries often! 3 year warranty.